Figure 1: The initial data plot shows GPS speed (black), engine rpm (red) and throttle position (blue). The area of concern is at 400m, where the engine rpm spikes as the rider leans onto the smaller circumference of the tire, effectively shortening gearing as he enters the turn. In this situation, the rider is on a 600cc machine at Willow Springs. 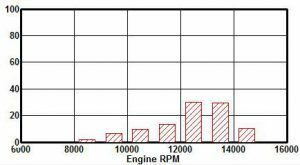 Figure 1 shows data for GPS speed (black), engine rpm (red) and throttle position (blue). In the area between turns 1 and 2, the rider must cross from one side of the track to the other, then arc into fast turn 2. At the 400m mark, the rider is just arcing into turn 2; as the bike leans onto the side of the tire, the reduced circumference causes the rpm to spike to the rev limiter momentarily and the rider must close the throttle slightly to account for the increase, before closing the throttle for the entrance to the turn. Figure 2: After a gearing change, rpm (green) is now lower although GPS speed (yellow) is similar in mid-turn. Although entry speed is lower on this particular lap, there is room for improvement whereas the gearing was limiting entry speed previously. The first aspect to consider in this case is whether or not this situation poses a problem. When dealing with gearing issues of this type – hitting the rev limiter – it’s worth noting that as performance improves, the situation can only get worse. For example, if the rider is hitting the rev limiter at the end of a straight, a faster lap will only cause the engine to go into the rev limiter sooner, making the problem worse. Address the issue early, before it becomes more of a problem. 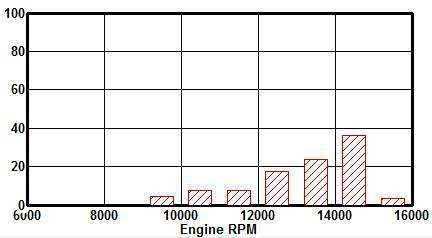 Figure 3: The initial histogram shows the engine was spending most of its time above the power peak of 14,000rpm. This situation will only worsen as the rider goes quicker. The situation can be rectified in one of several ways: Either the rider can upshift and downshift before the corner, the gearing can be changed, or the rider can straighten his line between the two corners, avoiding the effect of the tire’s circumference on gearing. Here, gearing was changed with a one-tooth-smaller rear sprocket installed. Figure 2 shows the new data added to the graph, with GPS speed in yellow and engine rpm in green. Note that engine rpm in the turn is significantly lower, even though GPS speed is very similar. The turn entry speed is slower with the new gearing, but for the first session with the new change the results are promising – we know that the issue of hitting the rev limiter with the same entry speed as previously is now gone. 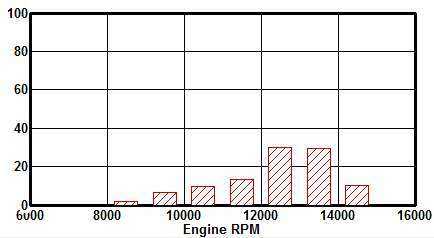 Figure 4: After the gearing change, the engine is spending the most time just below the power peak. As the rider goes quicker, this will approach the optimum condition as opposed to getting worse. It’s worth noting the effect on the rpm histogram as well. Figure 3 shows the histogram with the initial gearing. The engine spends the most time in the band above its power peak of 14,000rpm. Again, any as the rider goes faster this will only increase, with the engine spending more time further away from its power peak. 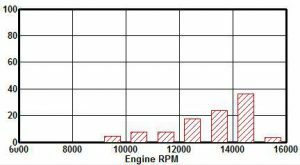 Figure 4 shows the rpm histogram for the new gearing, with the engine now spending the most time below its power peak. Although not optimum, this will improve as the rider goes quicker as opposed to worsening.